1. 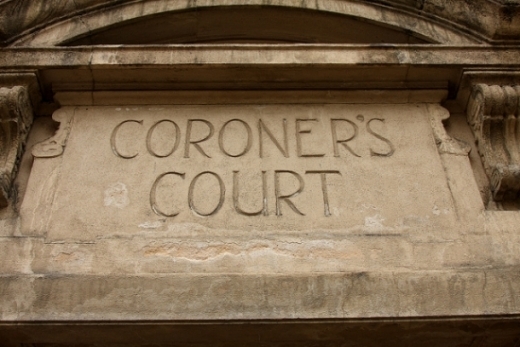 A Coroner’s Inquest is an inquiry into the manner and cause of an individual’s death, conducted by the Coroner or Deputy Coroner with a court reporter and six jurors present. The jurors are citizens of the county in which the death took place. 2. The jury is to determine the cause and manner of a death whether Suicide, Homicide, Accident, Natural or Undetermined. 3. Witnesses are summoned who have pertinent information concerning the incident such as the person who found the deceased, witnesses to the incident, a direct relative. 4. When the jury has concluded their deliberations, they will issue a verdict. The Corner’s verdict has no civil or criminal trial significance. The verdict and inquest proceedings are fact-finding in nature and statistical in purpose. 5. If a person is implicated as the unlawful slayer of the deceased or accessory thereto, an arrest may be affected. 6. The testimony presented at the inquest is sworn and under oath and properly documented and/or recorded. October 31, 1898 subpoenas for Louis Bebout (? ), Joseph DeJerrold, R.C. Workman, R.B. Dunsmore, Eugene McMahon and John Doe. (by E.R. Sundberg). October 31, 1898 – Listing the names of jurors to appear at the Barclay Hotel for service on November 1, 1898 – (by E.R. Sundberg) The jurors for the coroner’s inquest were R.D. Holden, John King, J.B. Spencer, B. O’Connor, Peter Dennis and John A. Wilson. November 1, 1898 subpoenas for Mary Aitkin and Mrs. Louis Bebo. They are being asked to appear on November 2, 1898. (E.R. Sundberg). November 1, 1898 – Sundberg requests the Sheriff to attach the body of Louis Bebo and bring him to the inquest. (by E.R. Sundberg). 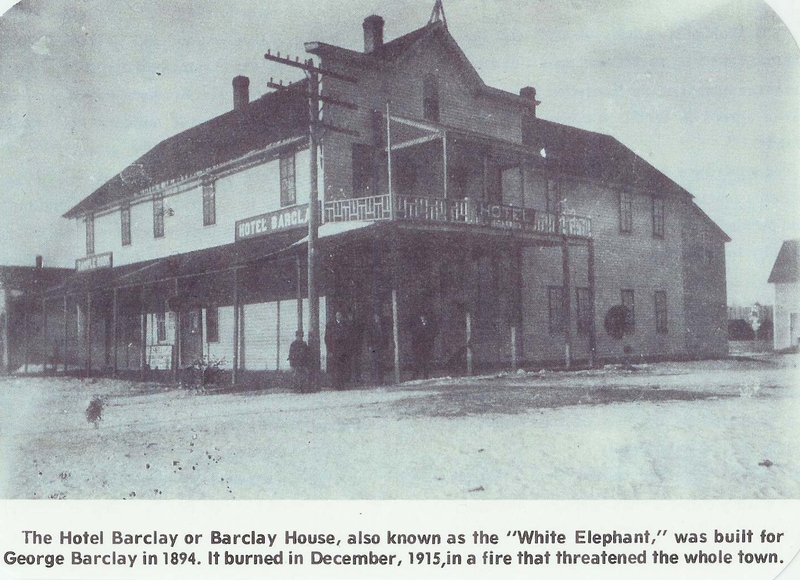 The inquest took place on November 1-2, 1898 at the Barclay Hotel. 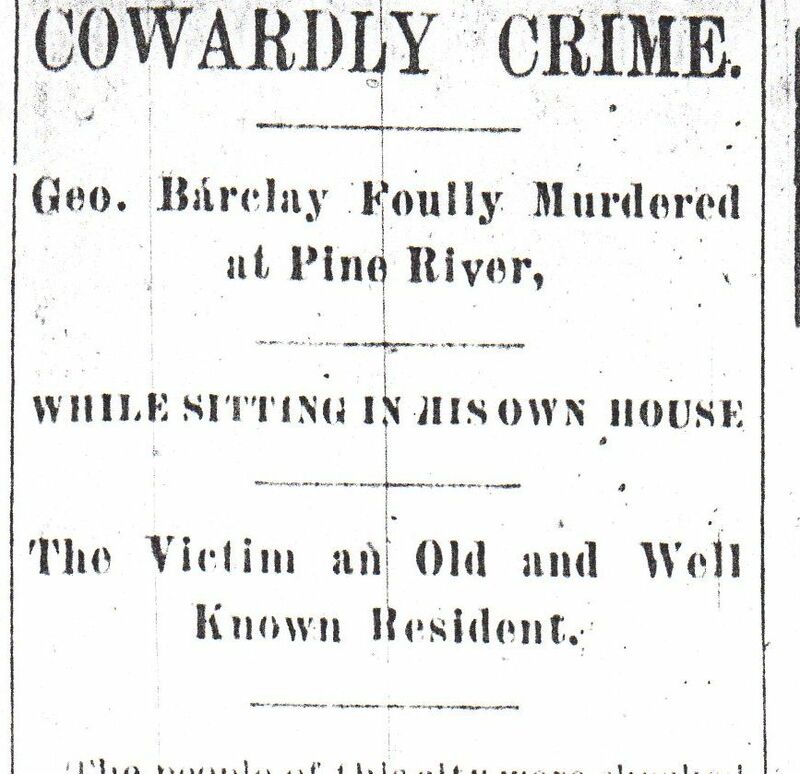 This was about 2 full days after the shooting that took place on Saturday, October 29, 1898 at about 7:10 to 7:30 pm. Here is a transcript of one of the subpoenas listed above. The State of Minnesota to R.D. H[olden], Peter Dennis, John Wilson, J.B. Spence, John King, & B. O’Connor you and each of you are hereby summoned to be and appear before the undersigned and to constitute a coroner’s jury for the purpose of holding and inquest upon the dead body of George Barclay, which inquest will be held at Barclays Hotel, Pine River, in said county, on the First day of November, A.D. 1898, at 9 o’clock in the forenoon. Hereof fail not at your peril. Given under my hand this 31st day of October A.D. 1898, E.R. Sundberg, Justice of the Peace and Acting Coroner. The mist was beginning to form, evening was coming. It had rained on and off throughout the day. The leaves were falling and a nip was felt in the air. It was late October 1898. The train had come in that day. It always came on Saturdays. The crowd of passengers it discharged was unusually large that day. By now, most of them had gone on their way. Heading home to their farms in the tall pines or out to a logging camp to prepare for the winter logging drive. The chore boy, McMahon was at the upper barn helping Bebo and his nephew, Deperrold, bed down their horses for the night. All that remained was to close up the barn and lock the feed box. A group of hunters had come in that day and were settling in at the station depot. The smell of dinner coming from Amarilla’s kitchen was on the breeze. The lights from the Barclay Hotel glowed brightly. Darkness was settling upon Pine River. George Angus Barclay settled himself in a chair, from this vantage point he could keep an eye on what was happening in his establishment. He had been tending bar in the saloon while Yllander, the bartender had been on dinner break. Yllander had returned to his duties. Good thing, he thought, it would be such a relief to sit down and rest his aching muscles. He was pleased there was a substantial crowd in the saloon this evening. The liquor was moving and the profit would be good. Several of the men were buying drinks for others. Talk filled the air. He settled back with a good cigar and the smoke from it circled upwards. The evening was going along pretty much like any other Saturday night at the Barclay Ranch. Clapp was arguing with Barclay about some national political issue and Amarilla, Mrs. Barclay, was in the kitchen going about her dinner chores when the report of the gun echoed out across the night. Amarilla’s head jerked up from her task and then she heard the commotion in the bar. Her long dress swished as she swiftly made her way to the saloon where she spotted her husband. He was crumpled there on the floor. Something was dreadfully wrong. 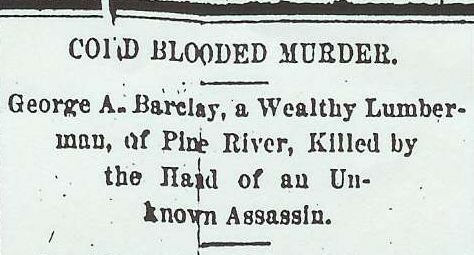 Someone was yelling “Barclay has been shot!” The men in the bar were running here and there. The tension in the air was sharp. Pandemonium reigned. Amarilla heard someone screaming and realized it was herself. Running over to George she knelt down, blood was coming from his neck. George Angus Barclay tried to raise himself but couldn’t. The pain was intense, he couldn’t get his breath, consciousness was fading. He tried to speak “Co…” came from his lips. Time had run out for George Angus Barclay. This man had survived the bloodiest years in United States history – the Civil War. As a fresh young recruit he an enlisted at Fort Ridgely, Minnesota at the time of the 1862 Dakota Indian uprising. Later he had traveled up and down the Mississippi as a wagoner with the 9th Regiment, Company I of the Minnesota Volunteers. 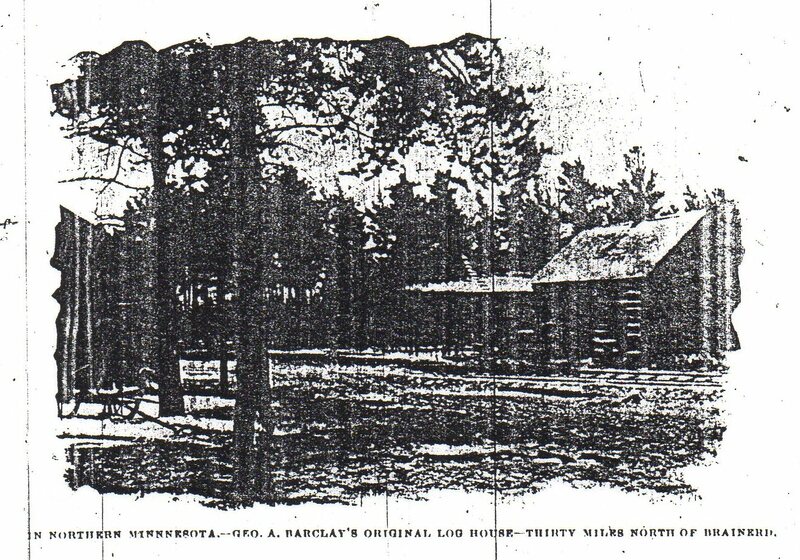 He had received an honorable discharge and returned to Minnesota to establish a trading post at Pine River. He farmed with his brother Alexander for a while, but it was not what he dreamed of doing for his life’s work. He married Amarilla in 1878 in Brainerd. They lost their son George Alexander at 18 months of age in 1881 and the following year 1882, he held his daughter, Grace, in his arms. Now he lay dying at age 54 and at the top of his life, successful in all he had done since the war. The Minnesota frontier had only challenged him and pushed him on and he had come to this end on the floor of his hotel on October 29, 1898 at about 7:30 p.m. Within 30 minutes or less, he was dead. As he lay dying, Amarilla applied a cold towel to his head, giving him the last few minutes of comfort he would have in his life. Written by his great-granddaughter, the person writing this blog, in 2005 from court records, newspaper accounts and more.